Catch swing fever with this beautiful and charming swing handmade from retired wine staves. Hang from a porch or a tree and swing your way back to the good ol' days. Handmade in Texas from retired French Oak or American Oak wine barrels. Each is one-of-a-kind and will vary. Color is likely to vary widely due to degree of use for red wine storage. Please see Wine Barrel Lazy Susan for an idea of the color variance: Red Wine Barrel Lazy Susan. Comes with chain, two carabiners and high-grade steel brackets. 200-lb. limit. Oiled finish. Seat: 34-37" L x 12-14" W. Chain: 60" L.
I bought this as a house warming gift for my sister. I was drawn to this item immediately and was shocked at just how nice it is. The color is very rich but natural and the quality is fantastic. The swing feels very sturdy and well constructed. I see that a lot of people are saying it is much larger than they expected but I think the large size makes it seem very warm and welcoming. A beautiful use for an old wine barrel. The swing is from another era (lovely) and hangs from our ancient oak perfectly. My children love it, and there's something very peaceful about it. When the sun sets, it a perfect backdrop to the "old oak swing." AWESOME for swinging wedd pics! Backyard fun, looking forward to the wedding reception on the swing! Beautiful workmanship. The swing is much larger than I anticipated and even nicer than displayed in the photo. Very happy with this purchase. Classic! Beautiful asset to our yard. Well, well worth the money...great value. I love the look and feel of it. I will be buying more as gifts. The carabiners sent with the product do not fit through regular swingset chain, so we had to buy more. We also had trouble hanging the swing so that it would swing smoothly. It's not the relaxing back-and-forth swinging that I had hoped for. It is still a beautiful product and a wonderful repurposing of wine barrels! Yesterday I received my swing and am quite please with the size. [...] I will have to go buy longer chains as I plan on hanging this on a tree branch. The chains included are for a porch or smaller area. Haven't hung it up yet but it is sturdy and big! I'm a bit worried 2 adults might try to swing on it. Can't Wait to Swing in the Spring!! The swing was much larger than I expected. It comes with everything but the tree!! The color is the same as my favorite wine.....merlot! Cannot wait for Spring to enjoy a glass of wine while sitting on my new swing in the woods. Purchased as a gift for VERY PICKY Boss. He loved it!! 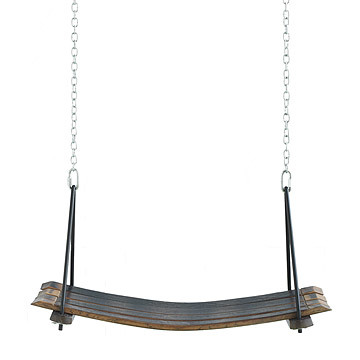 This handmade wooden swing is made from a recycled wine barrel stave. Hang from a porch or a tree and swing your way back to the good ol' days.